IF YOU have made a visit to Stockland Bundaberg recently, a new bright and beautiful mural might have caught your eye. 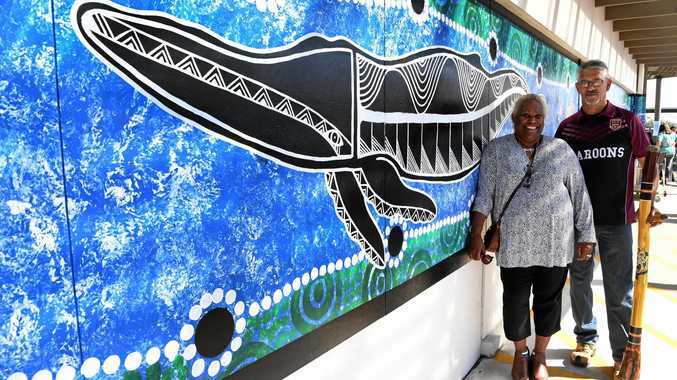 The indigenous art, which depicts our ocean and the life in it, was created by artist Uncle Joe (Howard) Butler and assisted by Aunty Kay Butler and was unveiled to the public this week. "The mural itself is all sea based and is about us as the gatekeepers of the bottom end of the Great Barrier Reef,” Mr Butler said. The 40 metre blue and green wall art, titled the Mural Wulgun Yuwarr (Sea Corroboree), stretches along the external shopping centre wall with various sea life intertwining throughout. Mr Butler said while preparing the mural, many people had stopped to take in the beautiful piece. "It was great, we had all of the people coming through and every time we did something different, they really acknowledged it,” he said. Mr and Mrs Butler, both born in Rockhampton, use their art as a way to express their heritage and culture. Mr Butler is a descendant of the Goorend Gooreng/Iman and Gangulu people while Mrs Butler is a proud Ungari Iman/Wulli Wulli and Djuru Umbie (woman) and South Sea Islander. Their most recent mural work, a project in collaboration with Gidarjil - Gidji Art and Stockland Bundaberg Shopping Centre, took the artists about four days to complete. "There was a little bit of planning but most of it was off the cuff,” Mr Butler said. Bundaberg Regional Council's Community and Cultural Services spokeswoman Judy Peters said the mural was a great addition to Bundaberg. "The interpretation that comes from art, especially through or indigenous ancestors, is really important,” she said.